Who’s really in the driver’s seat on Puget Sound transit spending? Transportation Choices Coalition has evolved from a community group advocating for bike, pedestrian and transit options into a political powerhouse with little transparency that coordinates ballot measures and raising billions for transportation megaprojects. 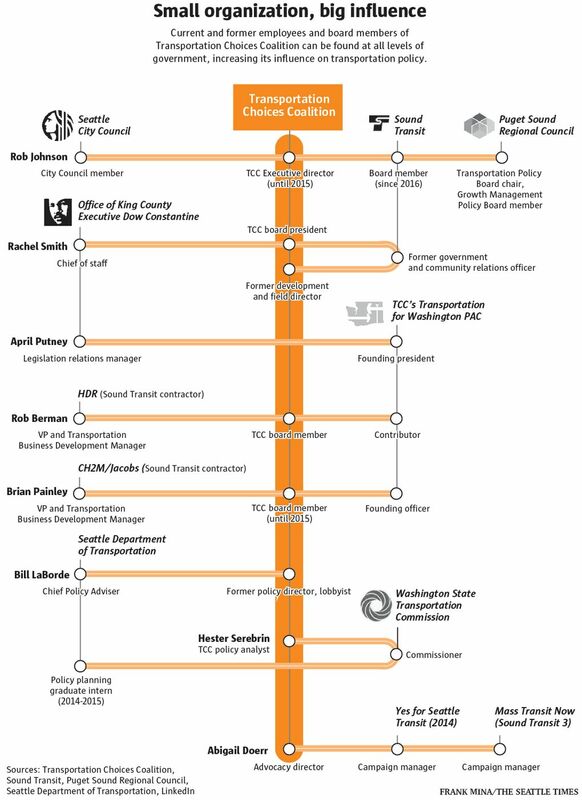 As the Puget Sound region debated the Sound Transit 3 campaign last fall, insiders were offered a glimpse into the political machine driving the $54 billion ballot measure. They learned how Transportation Choices Coalition, a small but well-connected Seattle advocacy group, shaped and won elections raising billions from taxpayers, over and over again. TCC Executive Director Shefali Ranganathan couldn’t help but boast in her plenary speech to a National Association of Transportation Officials conference in Seattle last September. Solutions: The public needs to know more about who is influencing their opinion and elected officials via nonprofit organizations such as Transportation Choices Coalition. Read columnist Brier Dudley’s suggestions for changes to improve disclosure and provide more clarity for nonprofits. “Every single day we push, we challenge, we support and we empower the people that run this city to be better, and we have a lot to show for it … in the last eight years we have won more than $20 billion in transportation investments for this region,” she said. Two months later, the TCC-led campaign for Sound Transit 3 was victorious, winning 54 percent of the vote and pushing that tally over $74 billion. Yet despite TCC’s remarkable political success and influence on the public purse, it has never registered as a political committee with the state Public Disclosure Commission. • Gaps in Washington state’s public disclosure rules for political actors. • TCC’s decision to withhold contributor details from the public. • The group’s questionable use of federal charity rules, reporting itself as a largely apolitical entity eligible to attain the most generous nonprofit status. More apparent is the cozy relationship TCC has with elected officials and public agencies, which heavily fund the organization. Voters should know more about TCC because it’s almost an auxiliary government agency, influencing the highest levels of governance in Washington. After decades of collaboration, state and regional transportation policies largely mirror TCC’s ideology, which seeks to boost transit options by making driving more expensive and inconvenient. Gov. Jay Inslee appointed a TCC policy director to the state Transportation Commission that develops transportation policy. King County Executive Dow Constantine’s chief of staff is a former TCC employee and its current board president. A former TCC lobbyist and policy director was hired as Seattle’s chief transportation policy adviser by former Seattle Mayor Ed Murray. Former TCC director Rob Johnson was elected to Seattle City Council in 2015. His predecessor, Jessyn Farrell, served in the Legislature from 2012 until her unsuccessful run for Seattle mayor this year. Taxpayers should also know their government agencies are major funders of TCC, through hefty membership dues. More than $1 million in public dollars funded TCC over the last decade, including at least $351,855 from Sound Transit, $363,500 from King County, $256,620 from Seattle and $73,500 from Pierce Transit. It’s one thing for governments to support community organizations that fill a niche, providing public services such as homeless shelters. But TCC has evolved from a community group advocating for bike, pedestrian and transit options into a political powerhouse coordinating ballot measures and raising billions for transportation megaprojects. State Sen. Curtis King, a Yakima Republican who chairs the Senate Transportation Committee, regularly talks with TCC representatives. Ranganathan said TCC segregates public funding and doesn’t use it for lobbying. She said the organization, which has six and a half employees, also provides education, such as events promoting transit ridership. But TCC’s overall purpose is to advocate for more transit and nonmotorized transportation infrastructure. While there are public benefits, this is also big business: higher taxes and spending particularly benefit giant construction firms and public agencies that are among TCC’s major funders. Because there still aren’t enough transportation dollars and road capacity to meet regional needs, and because of policy decisions, it’s become a zero-sum game. TCC’s advocacy results in resources being shifted from general-purpose roads to transit, bike lanes and other alternatives, by shaping criteria government uses to prioritize spending. Lately TCC is lobbying to add “health” to criteria the Puget Sound Regional Council uses when distributing federal road dollars. Health could be interpreted to favor spending on transit and bike lanes over roads. There’s at least one sympathetic ear on the regional council, where the transportation policy board is chaired by Johnson, the former TCC director. Such advocacy used to be considered lobbying in Washington, requiring organizations like TCC to fully disclose activity and funding sources. But the Legislature in 1990 narrowed the definition of lobbying, so efforts to influence policy development may be excluded from disclosure rules. Yet the lack of transparency around TCC reveals shortcomings in the law’s implementation and enforcement, and how “dark money” still influences elections and policy development. TCC’s funders include construction firms such as CH2M and Jacobs that profit from transit spending, but the amount they contribute remains secret. Public concern about the influence of powerful special interests increased since the U.S. Supreme Court’s 2010 “Citizens United” ruling. It removed limits on political spending by special interests, but also affirmed the importance of disclosure to inform the public of who funds campaigns. Even so, the source of campaign money can be obscured when money is funneled through nonprofit groups such as TCC. State Sen. Andy Billig, D-Spokane, has tried repeatedly to pass laws that would tighten state disclosure rules. He plans to introduce a version in 2018 that would require disclosure of donors to nonprofits that fund political action committees. “People should have their names associated with it,” he said. Enforcement of disclosure laws can be spotty because the Public Disclosure Commission is chronically underfunded and tends to depend on complaints to prompt an investigation. As a result, Washington lacks transparency “at all levels” of government, as called for by the 1972 initiative. This leaves the public in the dark about advocacy groups with enormous sway over public agencies and legislative bodies. Ranganathan says TCC files disclosure reports as required. It regularly reports its spending on an outside lobbyist and a staff lobbyist. Its lobbying reports also disclose grass-roots lobbying, but that reporting is sporadic and lacking detail. Grass-roots lobbying seeks to influence and engage the general public, as opposed to standard lobbying that’s focused on public officials. This opacity is partly due to the reporting rules, which send mixed messages about whether grass-roots lobbying applies to state or local activity. In what seems like a flaw, the rules don’t require disclosure of lobbying to steer policy development before and after elections and legislative votes. That’s where special interests can have the most influence. Either way, TCC failed to report grass-roots lobbying specifically aimed at pending legislation this year, as explicitly required by state law. Any organization that spends more than $700 a month or $1,400 over a three-month period on grass-roots lobbying must file monthly PDC reports. They must disclose expenditures and everyone who donated $25 or more during the grass-roots campaign. Transportation Choices hasn’t filed such reports. Instead, it disclosed some but not all grass-roots activity, via supplements to reports on its traditional lobbying expenditures. As a result, TCC’s grass-roots lobbying of the Legislature in March — over proposed changes to Sound Transit’s vehicle-license fees — wasn’t reported. TCC encouraged people to object, flooding legislators’ inboxes with hundreds of emails that could be sent via its website. It also circulated a petition, drawing at least 800 signatures, that was presented to lawmakers by its lobbyist in March. Yet there’s no mention of any grass-roots expenditures in that lobbyist’s March disclosure report. Nor did TCC file its own lobbying report disclosing the March activity. So the public doesn’t know who paid for that concerted effort to kill bills proposed in its Legislature. TCC spends around $700,000 a year on its programs. It regularly spends more than half on direct lobbying and influencing policy. About a third of its annual spending is described as educational activities, but some of that supports lobbying and political activity, according to company filings and annual reports. TCC appears to be sidestepping other state public-disclosure rules that would inform voters about its funding and activity. Any entity “receiving contributions or making expenditures in support of, or opposition to, any candidate or any ballot proposition” must report itself as a political committee in Washington. Such committees must disclose their financial supporters and spending. TCC has not registered as a political committee. Yet it makes no bones about being political, leading campaigns and taking credit for their victories. 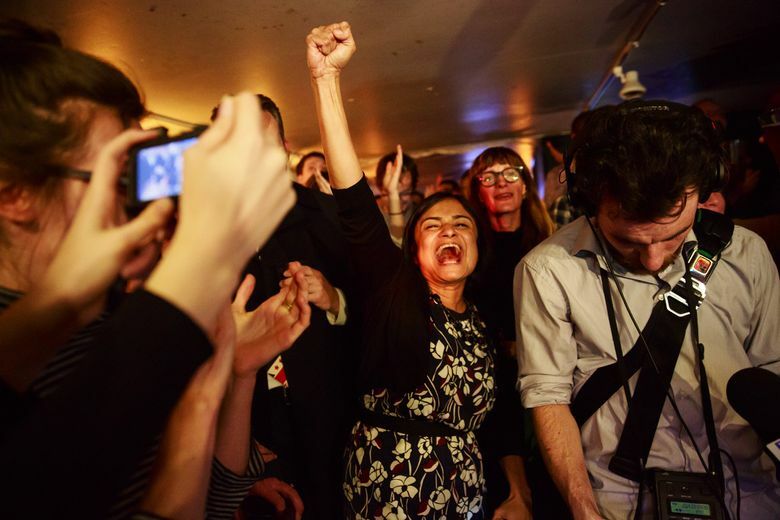 Ranganathan listed some of its victories in her September speech, including the 2008 Sound Transit 2 campaign, 2014 Seattle transit tax and 2015 “Move Seattle” levy that raised $930 million. For those ballot measures, stand-alone campaign committees were formed and filed disclosure reports. Their reports note that TCC contributed money and in-kind expenditures such as staff time to other committees. But they don’t disclose TCC’s self-described role as leading the campaigns, and the organization hasn’t registered itself as a political committee. Ranganthan said it discloses what’s required. “We report all our ballot activity to the campaigns that report and so that’s what the PDC requires and we are in full compliance with that,” she said. TCC’s annual report suggests it worked the ST3 ballot measure for a longer period than disclosed on the campaign reports. “For the past 18 months TCC has been steadily working toward putting a great Sound Transit 3 plan on the ballot. Now, we are pivoting into campaign mode as we lead the coalition to pass Sound Transit 3, a transformational transit expansion this November,” it said. That activity was defended by TCC’s board president, Rachel Smith, who is also chief of staff to County Executive Constantine. For groups seeking nonprofit status from the Internal Revenue Service, the ratio of political to educational activity is important. Too much politicking, and they’ll lose their 501(c)3 designation that enables donors to receive tax deductions. TCC is pushing the limit of this IRS classification, which is for groups that are only minimally political. Most of TCC’s expenditures are for lobbying and influencing policy and increasing transit funding through ballot measures. It boasts of winning dozens of political campaigns that increased taxes for transportation. Advocacy groups focused on policy often use a different nonprofit designation, 501(c)4. It allows extensive lobbying but donations to such groups are not tax-deductible. Ranganathan defended its approach, saying TCC is careful to follow IRS rules and uses an auditor to ensure it’s following the law. Yet it appears to be much more than an educational charity deserving 501(c) 3 nonprofit status. An IRS advisory on this topic explains: “Since the primary objective of the organization can be attained only by legislative action, a step that the organization encouraged or advocated as a part of its announced policy, as opposed to merely engaging in a nonpartisan analysis … it is an action organization” that does not qualify for nonprofit status. The line between educating people and building political coalitions can be blurry. TCC tells supporters that education is part of its strategy to win transit-funding campaigns. “We will be working tirelessly to educate thousands of residents and build support for these important measures,” its 2015 annual report said. IRS filings do shed some light on TCC’s political activity. They say it spent $1,694 to $3,420 per month, on average, on grass-roots lobbying from 2013 through 2015. That spending should have triggered more reporting to the state disclosure commission. Cross-checking tax filings with state disclosure reports suggest that in 2014, TCC may have spent more on political activity than IRS rules allow for nonprofits. But the numbers TCC submitted to the state are unreliable; Ranganathan said the disclosure form it filed was incorrect. That was the year TCC was working on a King County tax measure for additional bus funding and Seattle’s Proposition 1, which increased sales taxes and car-tab fees to fund additional bus service. To maintain nonprofit status, charities can spend no more than 16 to 20 percent of their budget on lobbying, although the limit and enforcement is squishy. In 2014, TCC told the state it spent $47,004 on grass-roots lobbying. It told the IRS that it spent $20,322 on grass-roots lobbying that year. Had the larger amount been reported to the IRS, lobbying would have accounted for 23 percent of TCC’s overall spending. If you count policy work as a form of lobbying, TCC is consistently over the 20 percent limit and should be registered differently with the IRS. In 2014, 68 percent of its spending was on lobbying and policy development. It was 64 percent in 2015, the year TCC lobbied the Legislature for Sound Transit’s new funding sources and led the Move Seattle campaign. Asked last week about the discrepancy in 2014 reporting, Ranganathan said the larger amount was erroneously reported to the state and it was actually a tally of campaign contributions. In that case, its annual PDC lobbying report disclosed zero grass-roots activity while its IRS filing said $20,322. When ballot measures raise billions for transportation projects, the biggest winners are companies that build the projects. TCC’s major supporters are a who’s who list of such companies, including major engineering firms such as HDR and Parsons Brinckerhoff. They’re listed as supporters in TCC’s annual report, but the group keeps secret how much the companies provide. Ranganathan declined to share funding details when asked, saying “it’s a policy decision” by TCC. “It’s balancing donor privacy with kind of disclosure and transparency is what we try to work with,” she said. TCC’s tax return for 2016, the year it worked on Sound Transit 3, shows that TCC received gifts ranging from $25,000 to $100,000 from 11 unnamed individuals. It’s no wonder they give: TCC’s pitch to donors says that for every $1.50 they “invest,” it will help return $25,000 in infrastructure spending. The need for more transparency about these funders increased in 2015 when TCC co-founded a political action committee, Transportation for Washington. That was the year TCC director Johnson ran for city council. As a nonprofit, TCC couldn’t support his campaign. But its PAC could, and gave Johnson the maximum allowable $700 and endorsed him. Transportation for Washington was started earlier as a broad, multiyear campaign for transit. Its founding officers represent key elements of TCC’s coalition: then board member Brian Painley, who at the time was director of strategic sales for engineering giant CH2M, and Toby Crittenden, who heads a labor-affiliated advocacy group called Washington Bus. When this subgroup evolved into a PAC, its founding manager was Andrew Austin, then TCC’s policy director. Its president was April Putney, legislative relations manager for County Executive Constantine, who at the time chaired Sound Transit. Johnson won the election and Constantine promptly appointed him to the Sound Transit board. Painley now works for Jacobs Engineering Group, a Dallas construction giant that recently merged with CH2M. The company won contracts to manage construction of Sound Transit’s rail lines, tunnels and stations connecting downtown to Capitol Hill, the University of Washington and Northgate, work valued at more than $1.6 billion. Exactly how much TCC received from CH2M, Jacobs and other firms benefiting from its political activity were never revealed, because of the lack of disclosure reporting and TCC’s decision to withhold such information. Effects of TCC lobbying touch every Washingtonian. It advocated for transit spending in the Puget Sound region that now exceeds $2 billion a year, even as state and local governments struggle to pay for basic services such as parks and courts. For the majority of residents in the region — who will continue to depend on cars for most of their travel — this brings added cost and delay, as resources are diverted to transit and agencies design roads, fees and policies in ways that discourage driving. Advocacy by nonprofits is valuable. But the public needs to know more about who is funding these special interests and how they are shaping policy and voter opinions. Washington taxpayers, especially in the Puget Sound region, are investing heavily in transportation projects. Yet they are denied knowledge of the insiders and advocates influencing this spending. These special-interest groups have an outsized influence on defining the public’s need and crafting the response. They shape the conversation, lobby officials and create allies by supporting politicians. Then they lead ballot campaigns to raise taxes for their favored projects. The people footing the bill must know more about who is buying this influence over their government and their lives.